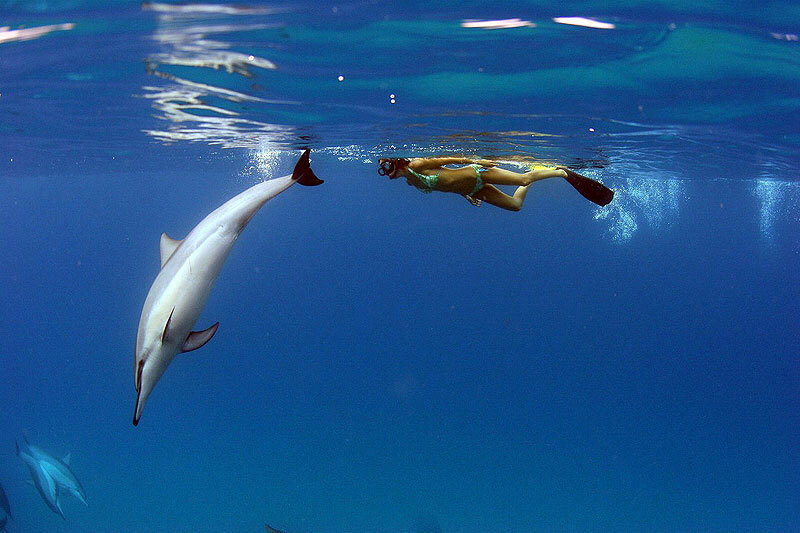 In September 2016 the Federal Government Agency, NOAA and it's law enforcement branch, NMFS, proposed the complete ban on all swimming amongst the friendly pods of Spinner dolphins in the coastal waters of Hawaii. We do not agree with this proposed regulation and will present a body of factual information that supports our contention that this activity, when conducted safely, poses no threat to the dolphin pods whose numbers are shown to be increasing. Send comments that will allow you to contribute to this process. This important issue needs more clarity and resolve as it affects all local matters for generations to come. What we ask that you do is to write to the above people with positive comments and support for a continued interaction without the newly proposed swim/ban regulations. See some example comments that were submitted. 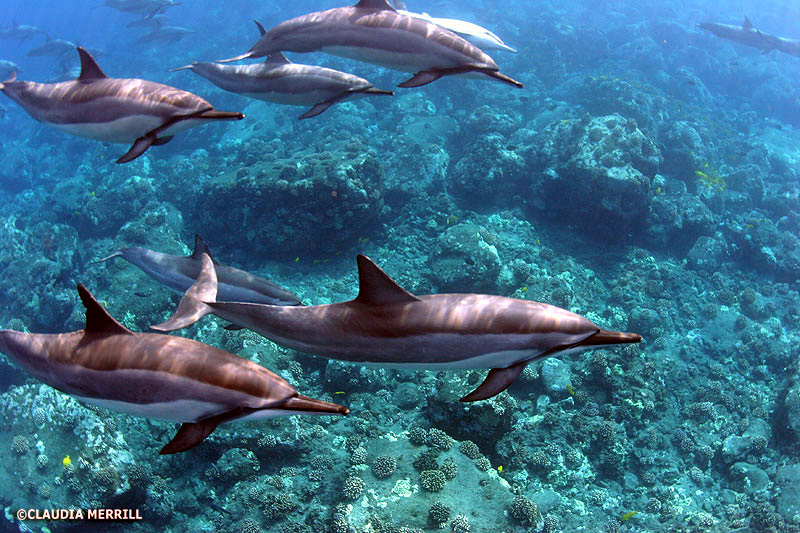 The proposed new regulation that will make it illegal to swim in proximity with free-swimming dolphins in Hawaii, at first glance, looks like an interest in and protection of the Cetaceans in our beautiful waters. There are many more concerns of significant importance, currently under your jurisdiction, much more dangerous and harmful to the cetaceans, that HAVE FAILED to be addressed. Of utmost importance to those of us really concerned with the welfare of Cetaceans, are the current sanctions approved by NMFS that allow for the massive killing, harassment and enslavement of hundreds of thousands of Cetaceans every year. - NMFS permits the yearly wholesale by-catch slaughter of thousands of Spinner dolphins by the Tuna Industry while still maintaining "Dolphin Safe" labeling on products. - NMFS has sanctioned "takes" of millions of Cetaceans by the US Military in weapons testing and use and subsequent slavery of certain varieties of dolphins being used as actual live weaponry. - NMFS allows the unbridled onslaught by the Oil industry using piercingly loud seismic equipment (louder than LFAS) and explosives with little or no regard to surrounding sea life and creating oil spill disasters that destroy entire cetacean and sea life habitats. - NMFS still issues permits to the captive dolphin industry that would allow them to hunt down dolphins in the wild in US waters and once captured releases all responsibility for their wellbeing to the Dept. of Agriculture. - NMFS allows the shipping industry to flood the oceans with noise pollution known to disturb and potentially harm the cetaceans. - NMFS has looked the other way while chemical toxins are leaching into multiple shoreline areas. NMFS should examine its own role in these, by far, more critical issues facing Cetaceans and their survival from the unbridled assault by this military/industrial complex. If the intention truly is to protect the cetaceans, you need to look at these current practices under your jurisdiction. These need to be reviewed immediately and steps need to be taken to cease these horrific sanctions. This is more life-giving than suggesting a relative handful of humans that float among free swimming wild dolphins presents a serious threat as it's something the dolphins either choose to do or do not. This especially in light of recent stock assessment over these past 5 years that show NO REDUCTION IN LOCAL STOCK. 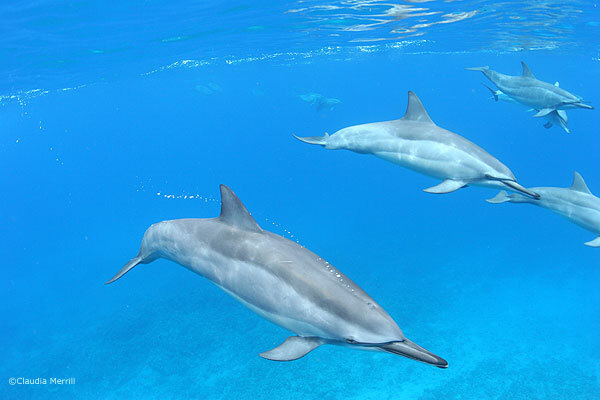 And testimony from local professionals going out every day on dive and snorkel boats, that the numbers of Spinner dolphins on the Kona coast is actually going up. There are far more affective ways that we can combat real dolphin abuse than the creation of such regulations that prevent all interaction in the wild. It is my experience that separation breeds apathy and ignorance, paving the way for the cetaceans' continued abuse by stupid people with no one responsible around to deter such activity. Everyone that I know who live and play in these waters are very concerned and protective of the dolphins. Dolphins and whales are a valued resource of the ocean and our world and have every right to living free of harassment and infringement of their lifestyle. It is our experience that, with a few exceptions, encounters are conducted in a respectful manner. - Clear and factual information flow through public forums and media. 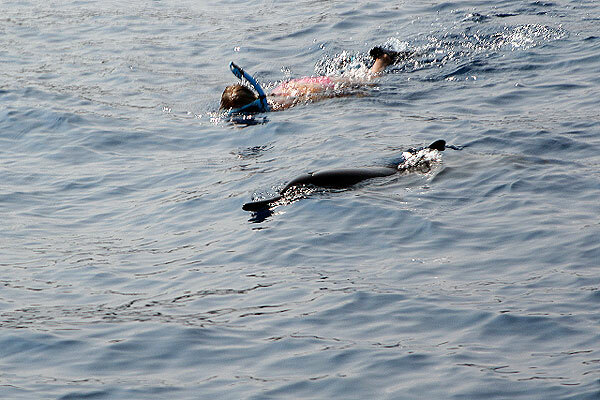 - Dolphin-swim Certification programs approved by a non-governmental agency such as those with the Humane Society, the Sierra Club or PADI scuba certification. - Professional Associations of guides, boat operators and rental companies empowered to self-regulate such programs. - Physical outposts distributing real, non-intimidating, factual information in problem areas where the public has been shown to be reckless in their interaction with dolphins. 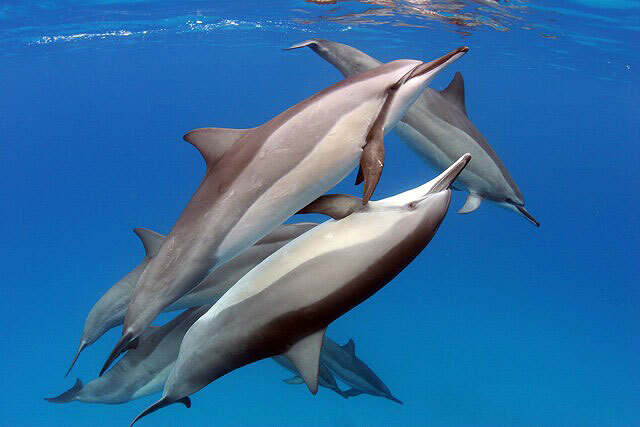 - Promotion of positive information about the nature of dolphins and their behavior that will serve to encourage respect for their environment and domain. - A public accessible database fully supported with government funding that will act to proliferate positive and factual information rather than the current system of negative press and police intimidation being used by this NMFS administration. These are but a few of many constructive ideas that are already available and will serve the greater need for understanding and respect of the Cetacean race by humans and more importantly may help to preserve the most precious resource known to us: Planet Ocean. 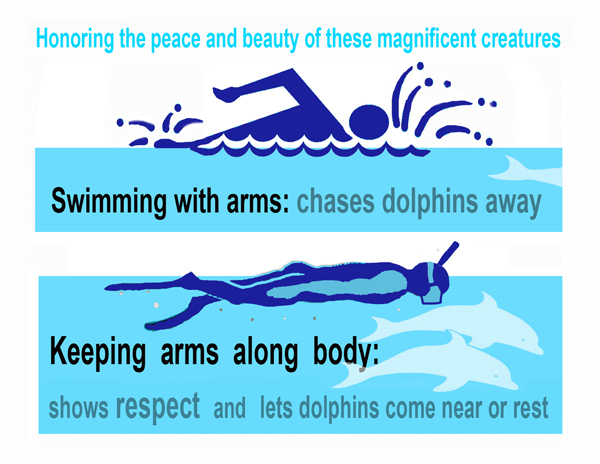 A citizen for safe and sensible human-dolphin interaction. Look to this website for further developments and information as it is made available. THANK YOU FOR YOUR CONCERN AND SUPPORT FOR HEALTHY INTER-SPECIES COMMUNION. Photos copyrighted courtesy of Claudia Merrill unless otherwise noted. Intellectual material copyright to the author(s).